For USENIX LISA 2016 I gave a talk that was years in the making, on Linux bcc/BPF analysis tools. Thomas has been using BPF to create new network and application security technologies (project Cilium), and build something that's starting to look like microservices in the kernel (video). I'm using it for advanced performance analysis tools that do tracing and profiling. Enhanced BPF might still be new, but it's already delivering new technologies, and making us rethink what we can do with the kernel. There's currently a pull request to add snap instructions, as there are nightly builds for snappy as well. This install will add various performance analysis and debugging tools to /usr/share/bcc/tools. Since some require a very recent kernel (4.6, 4.7, or 4.9), there's a subdirectory, /usr/share/bcc/tools/old, which has some older versions of the same tools that work on Linux 4.4 (albeit with some caveats). grep             69460  69458    0 /bin/grep -q g2. grep             69462  69458    0 /bin/grep -q p2. In /usr/share/bcc/tools/docs or the tools subdirectory on github, you'll find _example.txt files for every tool which have screenshots and discussion. Check them out! There are also man pages under man/man8. For more information, please watch my LISA talk at the top of this post when you get a chance, where I explain Linux tracing, BPF, bcc, and tour various tools. 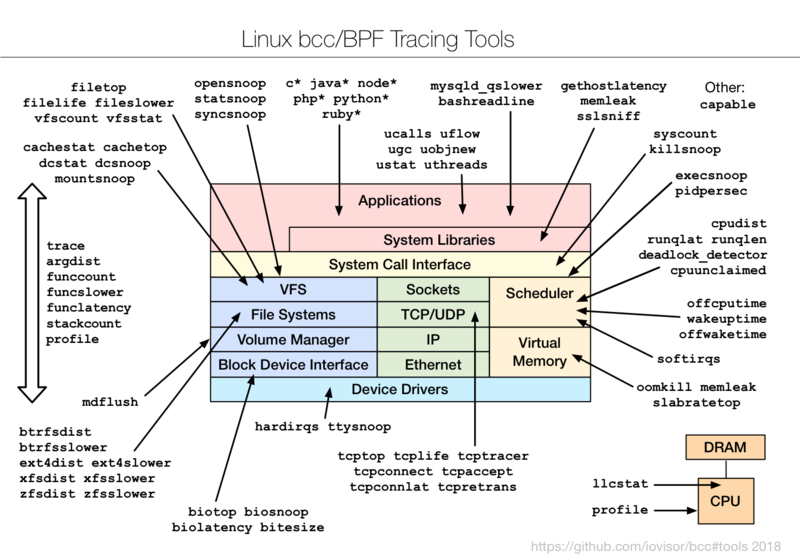 My prior talk at LISA 2014 was New Tools and Old Secrets (perf-tools), where I showed similar performance analysis tools using ftrace, an older tracing framework in Linux. I'm still using ftrace, not just for older kernels, but for times where it's more efficient (eg, kernel function counting using the funccount tool). BPF is programmatic, and can do things that ftrace can't.